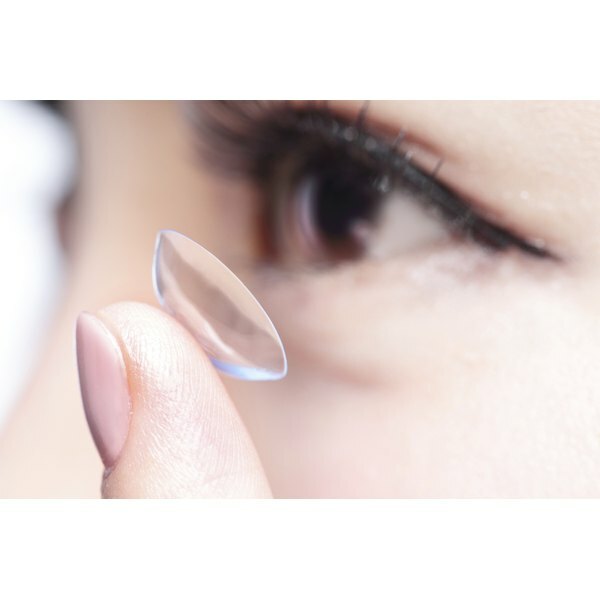 Contact lens overwear syndrome occurs when contact lenses are worn for too long. In contact lens wearers, the amount of oxygen that the cornea receives decreases, and if the contact lens is worn for too long, the cornea develops problems. In many cases, the patient first notices the symptoms a few hours after removing a contact lens or may even awaken from sleep with severe pain. In an article published in 2003, Phyllis L. Rakow notes that this condition used to happen mainly with PMMA or hard contact lens wearers, but can also be seen in patients who wear extended-wear lenses. In the article "Contact Lens Induced Ulcer: Best Treatment Option," Giannie Castellanos notes that in contact lens overwear, the lack of oxygen that reaches the cornea causes corneal swelling, or edema. Since the cornea needs to be transparent and thin for clear and normal vision, this edema leads to blurry vision. A rest from wearing contact lenses can improve this condition, but a change in contact lens wearing habits is also important to avoid recurrence of the symptoms and long-term consequences. A person suffering from contact lens overwear typically has extreme pain in the eye. This is caused by changes in the epithelium of the cornea--these can range from small epithelial defects called superficial punctate keratitis to a corneal abrasion. If not managed appropriately, the corneal changes may develop into a corneal infection or ulcer. If there is an abrasion present, the eye doctor will prescribe antibiotic drops or ointment to manage this complication and the patient should not wear contact lenses until the cornea is healed. Light sensitivity is typically associated with contact lens overwear syndrome. The book "Clinical Contact Lens Practice" states that there is often inflammation in the anterior chamber of the affected eye. The anterior chamber is the area between the cornea and the colored iris, and inflammation of this area leads to sensitivity to light. Depending on the severity of the sensitivity, the eye doctor may prescribe a drop that dilates the pupil, relaxing the iris and relieving some of the discomfort due to light.